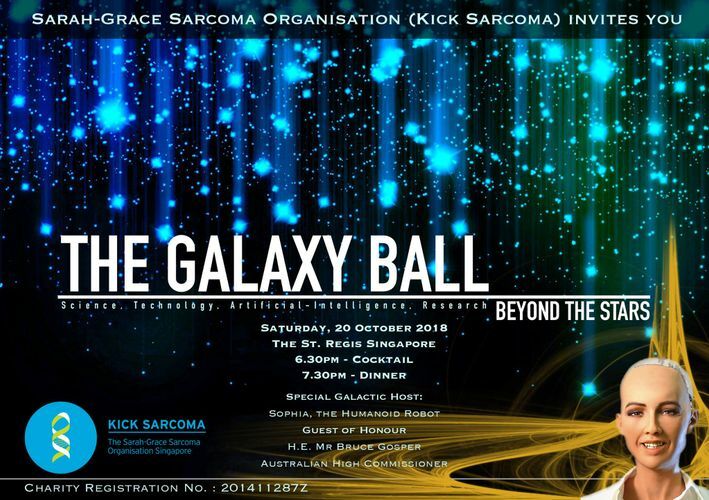 Galaxy Ball: Beyond the Stars is a black-tie gala dinner organized by the Sarah-Grace Sarcoma Organisation Singapore (SGSOSG) to raise funds for high-level research into finding a cure for sarcoma, a rare but deadly and under-funded and under-researched cancer afflicting mainly children. Guests will have the opportunity to meet with a special guest star, the world-famous Sophia the humanoid robot. Modelled after actress Audrey Hepburn, the lifelike and highly-advanced Sophia has appeared on the cover of Elle Magazine, starred on talk shows and international conferences, and addressed the UN. Sophia will be addressing how artificial intelligence plays a significant role in the research and development for finding a cure for sarcoma. To find out more and to support our efforts, please visit Kick Sarcoma website. For ticket purchases, please go to Kick Sarcoma website.